On the morning of Wednesday September 28th, Color of Change, the Black Alliance for Justice Immigration, and members of the #Not1More Campaign rallied at the Department of Homeland Security to demand the DHS follow the example of the Department of Justice and cancel its contracts with private prison companies that run a majority of its immigrant detention centers. The coalition delivered over 200,000 petitions collected by Color of Change, BAJI, Mijente and the #Not1More Campaign, CREDO, ACLU, Presente, Daily Kos, and America’s Voice as well as an organizational letter from Detention Watch Network with over 350 organizations co-signing. After the delivery event, the detainees confronted DHS Sec. Johnson on the street in DC with Cindy Barrientos imploring for the release of her son Wilhen who has spent more than a year in detention despite his three other siblings all having already being granted asylum. We, as members of the Durham Association of Educators, are writing today to lift up the importance of community-based organizing coupled with legal support. After 6 months in detention, our student Wildin Guillen Acosta is finally scheduled to come home to Durham. At the same time, at least 9 other NC and GA youth remain detained in Georgia and so we call for the immediate release of these young people. Last night, Wildin’s lawyer confirmed that the Judge had cancelled the full bond hearing and granted the $10,000 stipulated bond without the hearing. Stating that it was responding to issues raised by advocates, the DHS Office of the Inspector General announced it would be doing surprise inspections at immigrant detention centers and reporting its results to the Department, Congress, and the public. Advocates say that announcing something as basic as unannounced inspections exposes the current lack of oversight in the system that detains an average of more than 30,000 people daily and cite the OIG’s own history of corruption as a cause for skepticism. 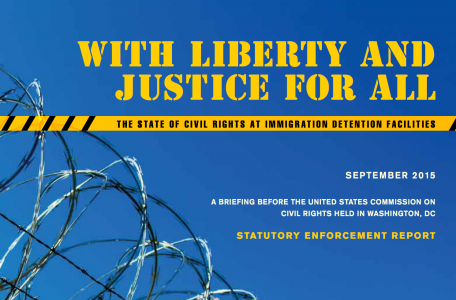 Citing the rampant abuse of transgender detainees, suspicious deaths at Eloy, and other facilities, medical neglect, retaliation against hunger strikers, and the continued insistence on detaining mothers and children despite being out of compliance with federal court orders, advocates say any report done well will outline a detention system that requires not just reform but a dismantling of the detention system that mirrors the efforts to reduce incarceration in the criminal justice system. For the past two weeks, people seeking safety in the US who ICE has kept detained for up to two years have refused meals as part of the #freedomgiving hunger strike in seven different detention centers. Krome, Etowah, and Aurora cut off calls to known supporters, trying to sever communication. Citing that leading Democratic candidates have made promises of reform in the future, #Freedomgiving hunger strike supporters rallied at Hillary Clinton’s office yesterday demanding that she and the other candidates speak out on the current crisis in detention. The report unequivocally recommended acting immediately to release families from detention. The report made dozens of recommendations ranging from medical care, language access, safety, free exercise of religion and treatment of children, families, and vulnerable populations.